The team at Wireless Warehouse works closely to ensure that all the sensitive data from your mobile phone is properly removed. We do not rely on human experience alone and so use the latest software to make sure every little data is removed. We work in a high security area with trustworthy employees who sensitively deal with your data. Every single device that we purchase is put through a multi-level screening process to ensure that the data on it is cleared and all active connections are deactivated. We also scan the device after the clearing process is complete to be doubly sure that no data is left on the phone. The entire process is done is a systematic and meticulous manner. Methodical and continued data erasing – Like mentioned above, we do not stop at just deleting the phone’s data in one go. Out multi-level cleaning process ensures that every little data from every little corner of your phone is removed before it is put up for sale again or sent for recycling. Deactivating connections – Though we urge our customers to deactivate all their active phone connections before sending the device to us, we run the process ourselves too to ensure that there are no active lines on the phone. The phone is sent through multiple checks to ensure every connection is disabled. Special checks for Blackberry – The US Department of Defence has certain directives in place for Blackberry devices. Through our erasing process, we adhere to all these directives to ensure a smooth and ethical process. Special checks for the healthcare industry – Our team of experts make sure that the HIPAA Title 45 CFR Part 164 is completed, in line with the requirements of the healthcare industry. Destruction of SIM card and memory – In our endeavor to make the process transparent and secured, we destroy the SIM card and the memory card of the phone in front of our clients, at a location of their choice. Safe work environment – To ensure maximum security to our clients, we work in a high-security area with employees who have been individually screened and cleared. Wireless Warehouse understands the damages that can take place with improper deletion of data and so it is our constant endeavor to provide security to our clients at all times. Data security is our priority and we do not proceed to sell or recycle any phone without securely deleting all the data from the devices you send us. So if you have an old phone that you don’t use anymore, send it over to us. If it can be used again, we will resell it. If it can’t, we will dismantle and recycle it in an environmentally friendly manner. But in both the cases, your data will be securely deleted first. Wireless Warehouse is dedicated to making the world a better place. Apart from providing data protection services, we also make sure we reduce the environmental hazards associated with e-waste. When we purchase a used mobile device, we make every attempt to sell it, but if that is not possible, we ethically recycle the phone without harming the environment. Every phone that is in a usable condition is cleared of its existing data and resold. However, some old phones are simply not in reusable conditions and so we have no option but to dismantle and dispose off the parts. This process is not taken lightly and is carried out very carefully. In doing so, we help our customers to reduce their organisations’ carbon footprints by a considerable amount. Before we shred the devices, we micro-shed the SIM and external memory cards to ensure that no data is left behind. The SIM and memory cards are shredded in the presence of the client. The rest of the device is shredded at our highly secured facility and the parts and segregated so that each can be recycled and reused in another device. We do not contribute to the ever-growing menace of e-waste and so our processes are a hundred percent environmental friendly. So if you want to dispose off your old mobile device that you do not use anymore but do not want it lying in a landfill, send it over to us. We will segregate the phone, the battery, the charger and all the other accessories and recycle them in an environmental friendly manner. At Wireless Warehouse, we make sure your data is properly dealt with. We use multi-step methods that ensure complete data deletion from your device. When selling your mobile device to us, it’s important for everyone involved (Businesses, consumers, Wireless Warehouse) to properly wipe all mobile data. However, this is not always possible and as a business house you may feel threatened by the prospect of your valuable data getting leaked. We at Wireless Warehouse take every precaution and make sure all your data is erased. We buy your old handheld devices and help you dispose them off in a proper way, which in turn helps reduce the carbon footprint of your organisation. Our services are reliable and a hundred percent safe because we use high-end software to erase the data. As a result, data that you didn’t even know existed on your phone gets cleared and you stay protected. We also ensure that all the active lines on the phone are deactivated. Though we urge you to deactivate all the lines and discontinue with the wireless connections before sending the device over to us, any oversight is taken care of. Our team of experts individually checks every phone to make sure the active lines are all deactivated before the phone is recycled or resold. Our work process is lucid and see-through. We mention the quotes and prices prior to any business transaction taking place and so you can be sure of the deal beforehand. We have a price list for the models that are still in the market and we price our deals accordingly. Any device that is in working condition is purchased by us. We do not discriminate devices based on their physical appearances. Wireless Warehouse is a dedicated organisation that has partnered with some of the biggest business houses in the United States of America. We offer our services to organisations in a number of industries such as education, healthcare, government, finance, retail and so on. Wireless Warehouse has a buyback program where you can get a quote from us – based on the phone you want to sell. Have an old phone just lying around? Sell it today! A phone that has been retired is of very little use. However, rather than having the phone lie around, you can sell it and make a good business deal. When you sell us an old mobile phone, the first thing we do is clean all the data that is there on the device. At times, just restoring the factory settings is not enough to erase the sensitive data that you may once have stored on your phone. The team of experts at Wireless Warehouse, with the help of high-tech software, delete every single piece of information stored on your phone so that your data is safe and never leaked out. We buy any old mobile devices that you may not be using anymore. We buy a phone that is in working condition and we resell it after deleting the existing data and repairing it, if needed. We offer a fair price for all phones that are still in the market and provide our clients with a list of quotations beforehand. This keeps our deals transparent and simple. We do not discriminate devices based on their physical appearances and so even if your retired phone has a few dents and scratches, you can bring them to us and we will be happy to purchase it. We look for value and not cosmetic appeal when buying an old phone. We also buy phones that are not in working conditions anymore. We use these phones and their parts for recycling and try to use the individual parts such as the batteries, the chargers and the other accessories. We shred the memory and SIM cards completely to avoid any kind of data theft. The parts of the phone that cannot be used are shredded and disposed off in an environmentally friendly manner. Whether we resell or recycle the device, we make sure every data ever recorded on it is completely erased. We also ensure that all active connections on the phone are deactivated before it is put back on the market. The brands that we buy include Apple, Motorola, LG, HTC, Samsung, Sony and Asus, among others. Our clients can approach us directly and we will be happy to help. You can call or email us and a customer service executive will get back to you. We then give you, our esteemed clients, the option to directly ship your devices to us or we send you prepaid, pre-addressed shipping labels which you can use to ship the device to us. We then sort the devices according to their usability and the data-protection service begins. The devices you send to us are handled with utmost care and every precaution is taken to ensure that your data is safely deleted. We also care about the environment and so recycle phones that cannot be resold. So do not keep a retired phone lying around anymore – just send it to us and we will find a use for it. At Wireless Warehouse, we make sure your data is properly dealt with. We will use multi-step methods that ensure complete data deletion from your device. When selling your mobile device to us, it’s important for everyone involved (Businesses, consumers, Wireless Warehouse) to properly wipe all mobile data. Some resets are unreliable and can leave information on your device that you’d never think to look for. Wireless Warehouse makes sure your data is 100% wiped before moving on. We use software called “Blancco Mobile” to wipe your device. This software is explained below. Wireless Warehouse has a buyback program where you can get a quote from us – based on the phone you want to sell. Have an old phone just laying around? Sell it today! See below. Secure – Where permanent data elimination is demanded Blancco is your safety-net to ensure your Organization is protected from liability. Blancco Mobile is 100% secure. No data will get through without it being overwritten, 3rd party testing and 3rd party independent approval via TÜV SÜD assures you (and your customers) of this. Multi–Tool Competitive Advantage – Blancco Mobile offers total data elimination functionality as well as our Reset feature in the same tool giving you a competitive advantage over others who may be restricted to resetting the devices only. Mobile processing is now streamlined so mobile devices can be reset faster than ever before while still generating Blancco’s digitally signed, tamper-proof report. Non-smartphone Support – Blancco’s new Mobile Reporting Tool can run in conjunction with Blancco Mobile and generate the same high quality reports for your database with the entered hardware information for feature phones (non-smart phones). Operationally Efficient & Economically Viable – Reduce the high costs related to employees manually operating these devices and entering data. Blancco Mobile removes human error and manual input, permitting large volumes of devices to be processed in an efficient manner with minimal staff making Blancco Mobile an economically viable business solution. Simplification – The optimization of efficiencies regardless of which process line is chosen (i.e. Erase or Reset) ensures the ability to deal with both situations within a single tool and system. Staff need only to maintain a single tool rather than multiple tools allowing you to optimize training, hardware resources, deployment, processes, functionality, familiarity, customization, automization and more. Scalable – meet your immediate needs and your needs in the future. Whether you need to erase 1000 devices per year in one location or 300,000 devices per year in several locations across the country, this solution will grow with you and will not restrict you as you do. Completely Auditable – either by you or 3rd parties. Blancco Management Console will permit your Organization to easily audit the status of individual device erasures or entire batches of reports at once with our digitally signed erasure reports and the added functionalities of the Management Console also allow for the creation of an access portal for your end customers to review the reports associated with their devices. Advanced & future friendly – Rest assured that not only are you able to erase devices your customers have now, but also due to Blancco’s commitment to product development and R&D you will be able to adapt to devices requiring erasure in the future. You are already prepared. Erase Flash Media Cards – Blancco Flash is the recommended overwriting solution for securely and permanently eliminating data on the external SD cards found in mobile devices. Blancco Flash, also produces digitally signed erasure reports, which can be automatically sent to Blancco Management Console for audit and asset management purposes. No need for a separate product, we’ve got you covered. 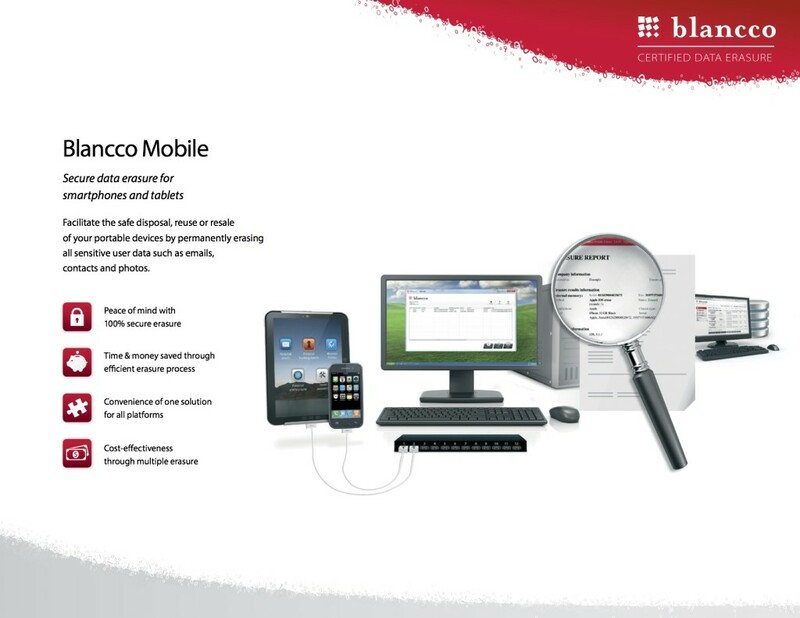 Blancco Flash is part of our Mobile Data Erasure Management Solution. Asset Management System Integration – Blancco Management Consoles built-in API integrates with modern AMS systems ensuring automatic data entry of hardware specifications. No need for manual entry of IMEI’s, Make model description, etc.into your sales system. A Solution that is here for the long run – Blancco is the only financially stable company in this industry, as such we offer the only financially stable platform on the market. Why choose and invest in a solution that may not be here to support your business. Blancco has been in business since 1997; we’re not going anywhere.